Conifer trade on the traditional values of customer service, reliability and quality of work. We take pride in being an approachable damp proofing company and we cover a wide area with our damp proofing work. Having carried out extensive waterproofing and tanking work in the Powys, Ceredigion, Aberystwyth, Welshpool and Mid Wales regions over many years, we have helped many people to improve the quality of their properties. We use only our own staff and our projects are properly supervised. Indeed, as much care is taken in the initial protection of the working areas as in the completed works. Our damp survey reports and plans are very clear and detailed, they are used to indicate areas of work and the materials proposed. You will find our reports to be honest and easy to understand. We always give truthful advice based on years of experience in this field. Conifer work closely with the materials manufacturers to ensure that, whether you require a chemical DPC or basement tanking, you always get the right products for purpose. 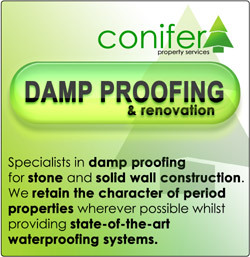 Conifer are damp proofing specialists who take pride in our work. We will treat your property with the respect it deserves. By scheduling and supervising the works properly, we aim to keep any disruption to our customers to a minimum. We work all aspects of the business and it is highly likely that the person specifying the materials for your project will be part of the installation team. We believe in knowledge AND experience to get the job, not only done, but done right and most importantly of all, done once! For damp proofing services call us for free advice or send us your enquiry via email and we will get back to you as soon as possible! We provide Damp Proofing, Damp Proof Course injection, DPC, DPM, Chemical Injection (Dryzone Dry Rods), Structural Waterproofing, Vandex Slurry Tanking and Membrane Damp Proofing Systems across the regions of Powys, Ceredigion, Aberystwyth, Welshpool, Newtown and Mid Wales.